I'm not sure whether to feel flattered or not, but when a photographer recently wanted to take my picture fishing, I figured it couldn't hurt and if photographing me broke his camera, well that would be his fault. I've experienced photographers before, such as over on the Taylor, and figured it wouldn't be all bad. 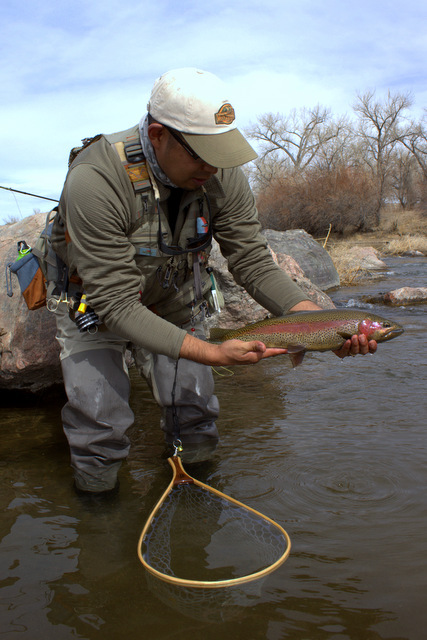 It all began a week and a half ago on Friday afternoon when I headed over to fish Boulder Creek for an hour or so. Upon arriving at the parking area, I got out of my car and started rigging up to fish. A photographer from the Daily Camera approached me and made the rather astute observation that I was about to do something "outside." Since his assignment was to take a picture of someone doing something "outside," would I be so kind as to allow him to take my picture? After getting my name, he left me to do my thing while following at a respectful distance. Soon I was fishing away, nearly oblivious other than when I heard the camera clicking away. Soon I found myself on an ice shelf under a bridge where a nice brown came out to swirl on my streamer. 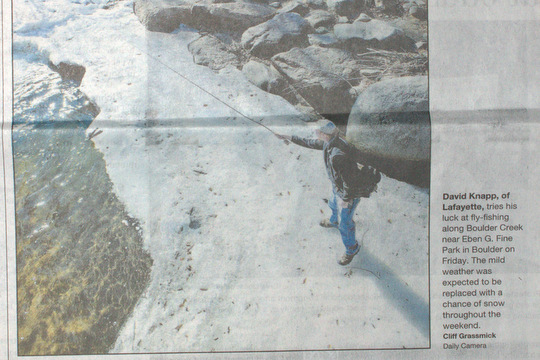 Hoping to lure it back out again, I continued fishing and soon found myself photographed right into the newspaper. 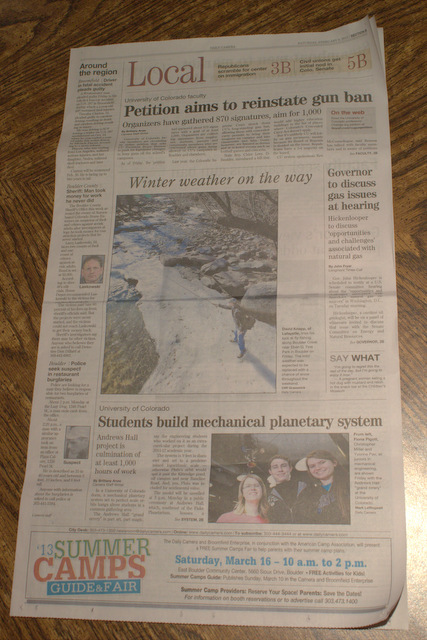 That's right, on Saturday morning there I was, front and center on the "Local" section, fishing away on the ice shelf. I soon told the photographer I was heading downstream "a ways," and he graciously allowed that he had got all the pictures he needed and said his thanks and good bye. I enjoyed the next hour and ended up with four fish so it was not a bad trip! In an article over at Time online, I discovered the technology of the future for fishermen and a creative outlet for the energies of big pharmaceutical companies who spend too much time finding more ways to drug the general human population of our earth. In the study reported in the article, researchers from Umea University in Sweden tested perch to see if the anti-anxiety drug oxazepam would affect them at all. In a stunning turn of events, the perch NOT exposed to the drug behaved just as normal perch should in various controlled survival related activities. However, the fish who were slightly exposed showed a higher propensity to feed more and faster. Imagine fishing where the fish are always hungry!!! Instead of paying thousands of dollars for that trip of a lifetime to untouched waters where the fish jump on your line, just find a way to get some of this drug to your favorite fishing hole and doctor up the fish! Even more shocking, the fish with a high exposure to the drug were almost totally fearless. 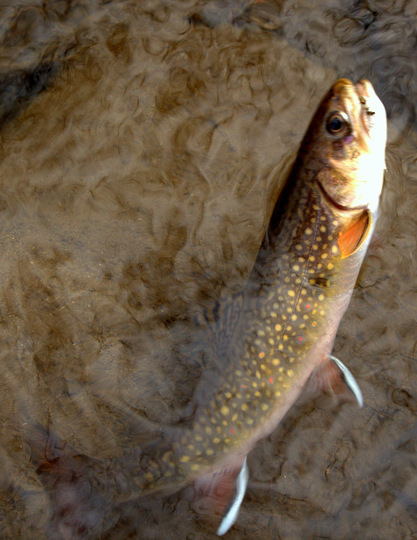 Imagine finding that big brown you've been waiting to catch feeding on a hatch. 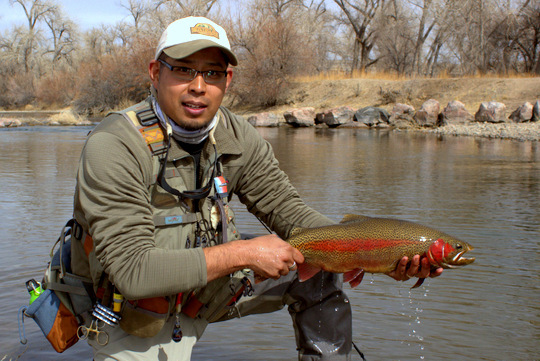 Wading carefully into position, you give two perfect false casts and then slam the line into the water over the fish's head. Instead of bolting, the fish waits patiently for your fly to drift overhead before rising violently to inhale the offering. The possibilities are endless for fishermen. Of course, I'm sure this could be used by poachers as well for devious purposes. 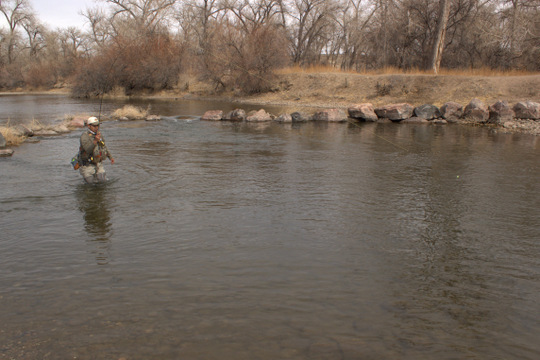 Entire rivers devoid of catchable fish are a distinct possibility here people!!! Will the good guys corner the market first? Only time will tell. As always, I'll stay on top of this potential double-edged sword and continue to work diligently to make this a more fishermen-friendly world. So, I know I promised a lot of upcoming posts, and now I need to apologize for not having anything else up yet. However, I just returned from the dead. Well, not literally, but I've spent that last week being miserable with the flu, and only now are things beginning to look up. I promise, I haven't forgot to post and am hoping to even get out on the water at least a little over the long weekend. Stay tuned for more! The local creeks are fishable!!!! That's the big news, at least for me. 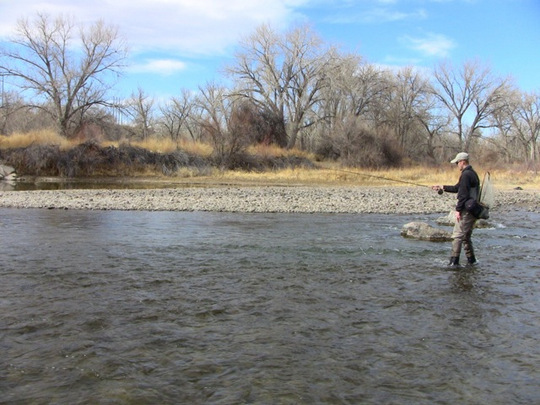 The fishing is challenging but on warm days it can improve drastically as low elevation snow and ice melt fill the creek and the water takes on a slight stain. I managed a couple of hours fishing on both Friday and Sunday afternoons. The difference? Friday was in the 50s and the water was slightly stained while on Sunday I was fighting ice on my line and in my guides the whole time. Amazingly, there were more fish sitting out on Sunday but they were also way more spooky than the fish on Friday. Of course, with the slight stain on Friday it is a distinct possibility that I wasn't seeing fish that were actually there. 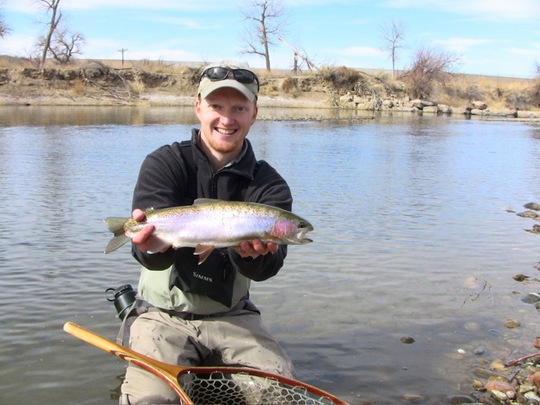 The fish were a bit more willing to chase on Friday in the slightly warmer water temperatures. The larger fish did not seem to want to expend energy for the most part. 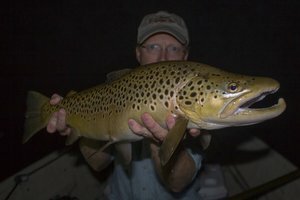 I had some nicer browns come out and casually stare at my slowly bounced streamer but looking and eating were two different things. One of the amusing aspects of Friday's trip was being photographed for the Daily Camera, Boulder's newspaper. More to come on that later. 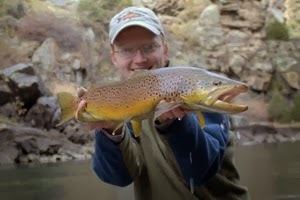 I fished slowly and enjoyed my time on the water while adding to my knowledge of Boulder Creek. Each stream has its own set of quirks, and I'm slowly learning what is now my local creek. 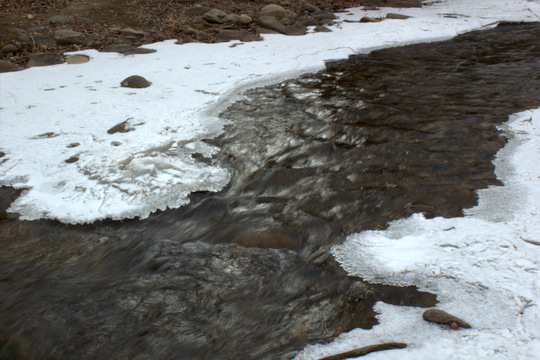 As with other Colorado waters, etiquette seems to be lacking on Boulder Creek (expect a rant in the near future). I had one guy stop and fish the other side of the pool I was working and even casting in the same spot I was fishing on Friday, and I'm talking about a fly fisherman who should have known better. Anyone who has ever fished Boulder Creek knows the pools can be a bit tight to say the least. The best part, I could have hit him with probably 5 feet of line out plus my 9' leader. Yeah, that's close! 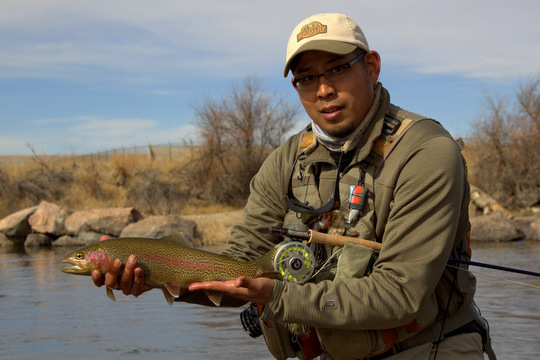 Despite the cramped fishing conditions in one pool, everything else was wide open for me to fish! 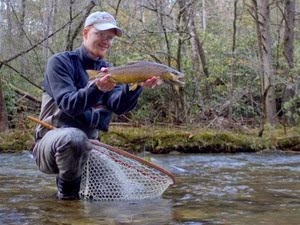 I worked the pools with various small streamers and started to find willing fish. The larger fish were tight to structure and would ease out from under ice shelves or back eddies to stare at my streamer before vanishing again. 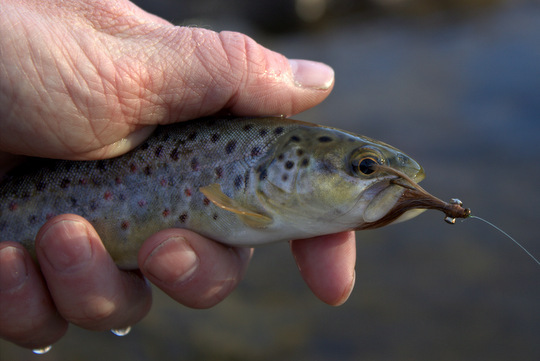 On Friday I finished the day with 4 little browns to hand and all came on the streamer. 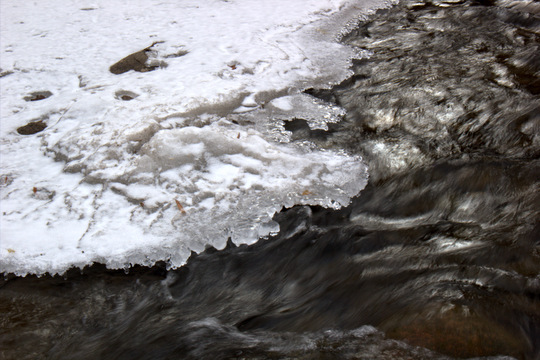 Yesterday, despite the cold temperatures, the ice along the creek was continuing to loosen and melt although at a much reduced rate. I expect this current cold snap to keep the fish sluggish for at least a few days. Early on, I had some shelf ice that looked like the bank (covered in sand) break under me. Since I was in hiking boots and jeans, the result was a bit chilly. Thankfully I stayed warm enough to fish for a good hour or so before calling it quits. 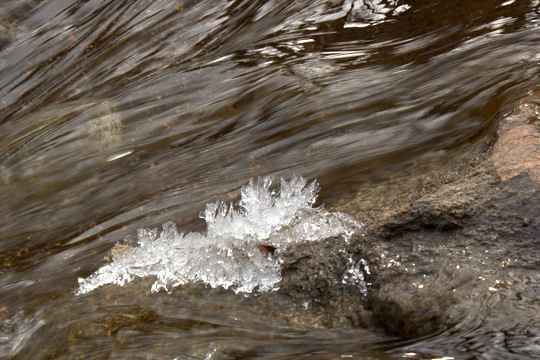 The ice on the stream created some beautiful pictures just waiting for my camera to come out. 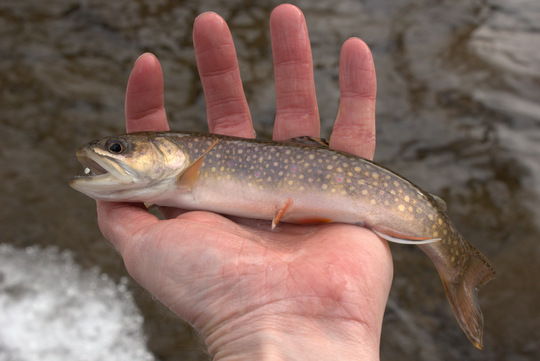 The only fish I managed yesterday was a persistent brook trout that hit and/or followed again and again before finally impaling itself on the small streamer. Gotta love brookies!!!! 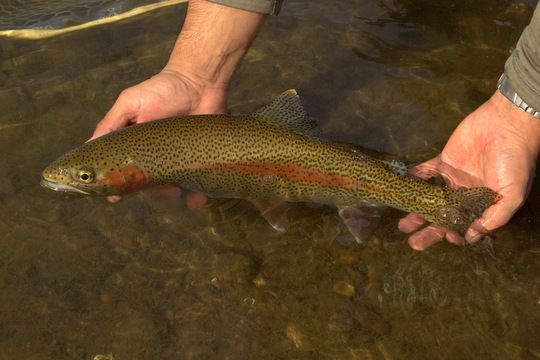 This winter I really fished streamers almost exclusively in the freestone streams nearby when they were fishable. 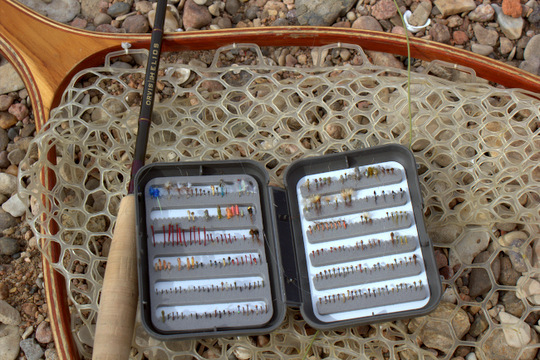 On tailwaters I have stuck with the tried and true double nymph rig with mostly small stuff. 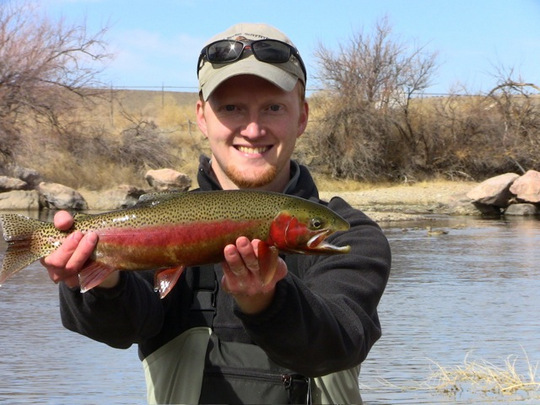 Streamers are nice in that they require a more active approach and also the results are so visual. 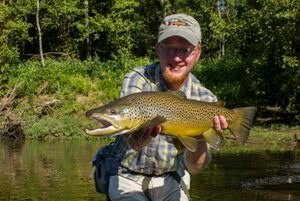 There's nothing like seeing a charging brown, even if its just a little 8 incher. I've been tying more and more lately and will probably fish again this next weekend. The long weekend could turn out to be epic so stay tuned for more!!! The poll on fishing days for 2013 recently closed. I am impressed by the goals most of you have set, especially whoever is planning on 200+ days on the water? Guiding? Fishing for yourself? Whatever the case it is pretty cool and something most of us can only dream of. Most of you are in the 30-60 days fishing category. I'll hope that means most of you are targeting closer to 60 days rather than 30. My personal target is around 70 days on the water. I'm busy enough these days that the goal may be overly optimistic but one can always hope. At times I long for the ability to fish every day or at least spend time on the water. I'm sure all the guides out there would tell me that guiding isn't that great and just as much of a hassle as any other job, but there are definitely days that it sounds appealing. Helping someone else fish is better than not being on the water at all! Its not often that I feel this generous, so enjoy it while it lasts. This is a fly that I don't show off a lot and often go out of my way to avoid showing people. 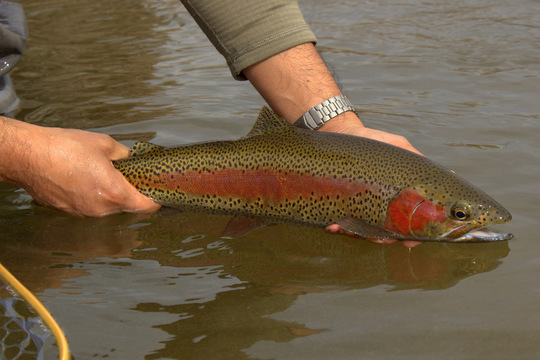 However, it seriously should be in everyone's box if you fish for trout! 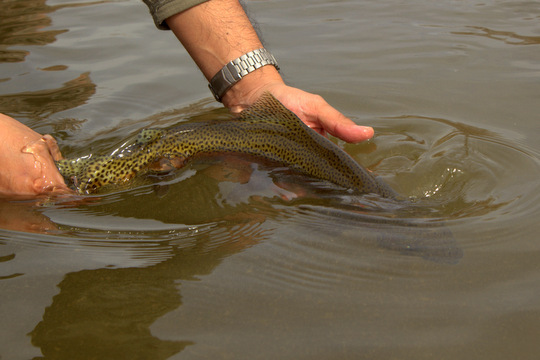 I've caught trout on this pattern in freestones and tailwaters. 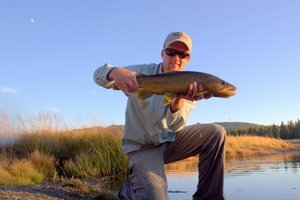 It works best as a dropper under a dry fly although you can fish it in a single or double nymph rig as well. The fly is the Ultra Wire Soft Hackle. Yeah, I haven't come up with a cool name for it and perhaps someone else ties it and already has a name for it. While it is similar to other patterns (copper and partridge anyone? ), I haven't seen too many people tying and fishing this pattern. I can tell you that under the right circumstances, this is as good a dropper as you will find anywhere. Naturally it works best only at certain times. 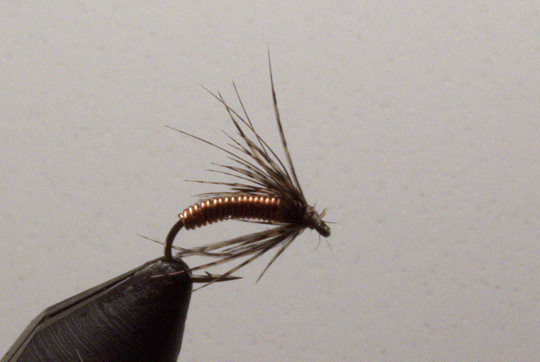 It is not a miracle fly but excels during both caddis hatches and also when mayfly emergers are on the water. 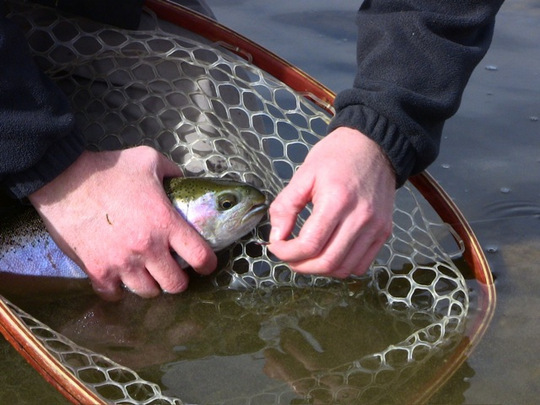 Tie some up and fish them this spring and see what you think. Hackle: 2 turns of partridge or favorite soft hackle feather. You can tie these things in a HURRY and, did I say, they flat out fish!!!?!!! The snow situation here in Colorado is still far from being encouraging. Wyoming is faring a bit better which at least suggests that a Yellowstone trip is still a definite possibility. However, here in our local area, the snow is still severely lacking. Here is a picture I took last Saturday. 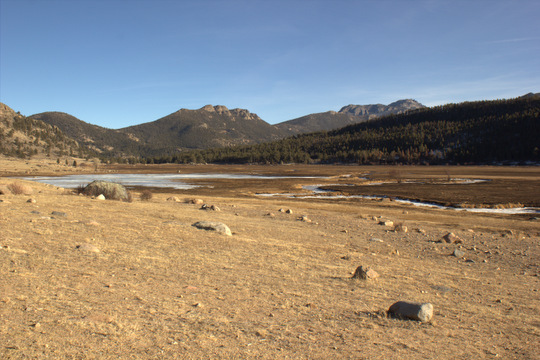 The lower valleys in Rocky Mountain National Park do not even have any snow. The peaks have some but nowhere near enough. 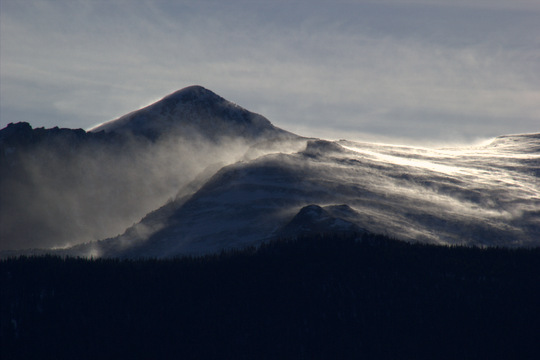 While the snow might be meager, the howling wind and blowing snow is keeping the highest elevations locked in winter's embrace. The following pictures were also taken this past Saturday. 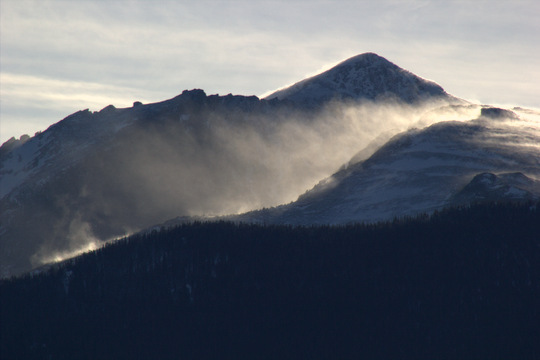 Snow was blowing along and off of the mountain tops by strong northwesterly winds. A storm is at least possible this upcoming weekend. We need a lot of moisture this spring to avoid another bad fire season here in Colorado. While I am ready for warmer weather and lots of open water fishing opportunities, I will be glad to wait for more snow before the warmup starts. So, I know there are some good sources out there for cheap tungsten beads and was wondering what the best deal (quality + price) is out there? Anyone have a good source for tungsten beads that you would be willing to share? I'm not looking to buy in quantities of more than a hundred at a time at most. Thanks! 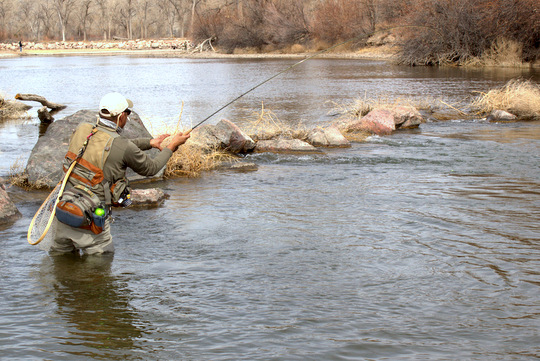 The poll on how much fishing you hope to do this year has been extended. I know there are lots more readers who have NOT voted yet so please take just a moment to give me some feedback. Just a couple of mouse clicks is all it takes. Find the poll over to the right near the top of the page. You only have a couple more days so do it now! 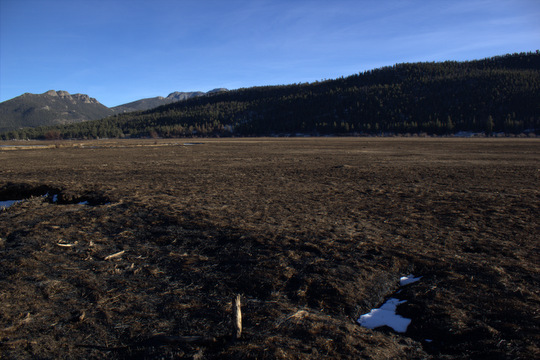 For the first time since the Fern Lake Fire burned through Moraine Park, I returned to see what damage occurred. Not sure what I would find, I was probably more apprehensive than anything else. The first glimpse went a long ways towards encouraging me. The meadow is changed, that much is for sure. 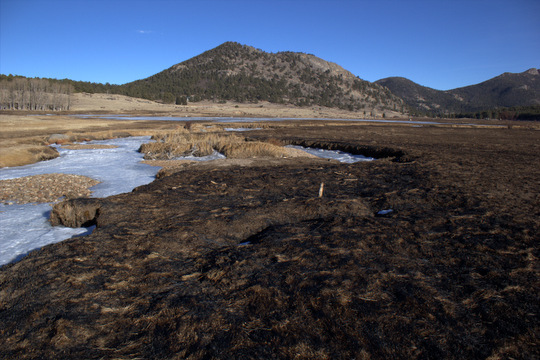 The vast majority of the tall grass burned while the fast moving fire rolled through. A wet spring will help a lot though and the meadow is ready for a lot of new growth. The fire obviously did not burn hot for very long as it made the run down the valley. Islands of unburned grasses were to be seen throughout the meadow. Stream-side willows and other vegetation were a bit charred towards the ground but not dead, at least not in the small area I saw.